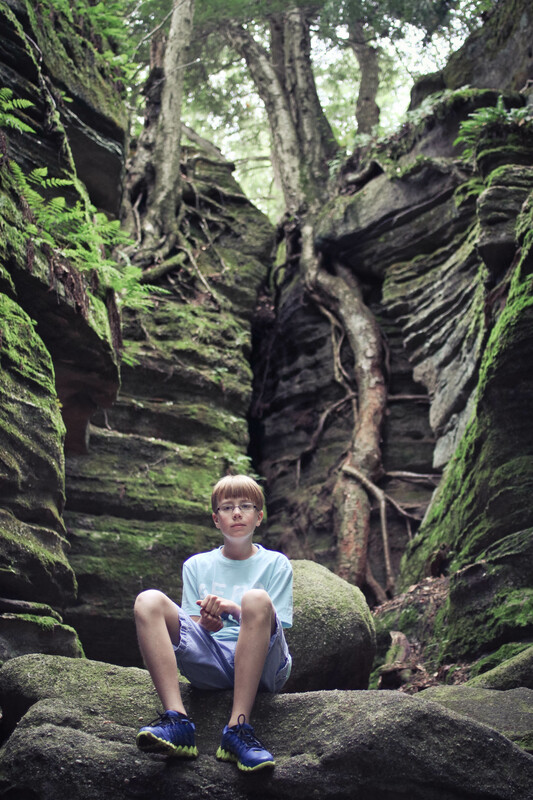 Yesterday we escaped to Chautauqua County, NY and spent the afternoon hiking Panama Rocks. If you’ve never been, put it on your bucket list. This privately owned nature preserve originated as sand and gravel sea islands over 300 million years ago. Geologists believe the islands were part of a delta covered by sediment and eventually compacted into rock. Eventually the rock was uplifted to it’s present altitude and during the last ice age, a glacier cut into the exposed rock. Since then, a lush forest has grown over the site. With gigantic tree roots, hundreds of passage ways and caves, and delicate ferns and moses, one can spend several hours discovering this natural wonder. I shot this photo with my Canon DSLR and my 35 mm lens. My settings were ISO 400, shutter speed 160 and aperture at 2.0 My biggest challenge taking photos at the park was having to constantly be changing my settings. Down in the caves it was very dark, yet above the towering trees there was bright light shining through. I used my Canon most of the time, because my phone camera seemed to struggle with the lighting. In the end, I got a few shots I really loved, but I really don’t think any photo can give this area justice. Kind of have to see it to truly appreciate it. The edit was done in lightroom. I first applied a Rebel Sauce preset, which muted everything a bit. I then very subtly decreased the temperature, increased the exposure, increased the fill light and clarity, sharpened and increased the luminance.